Splatoon 2 is an online multiplayer game on the Nintendo Switch. There are multiple game modes in this shooter so you’ll never get bored! The original Splatoon was released on the Wii U in 2015, it brought a new franchise to the world of Nintendo. In 2017 the long-awaited sequel Splatoon 2 was released, that day, my favourite game was released to the public. When entering the game you’ll be shown the news by Pearl and Marina from Off The Hook, they’ll give you some information about what’s been happening. You’ll be told that the great Zapfish which powers the city’s power has gone missing and so has popstar Callie! Find her popstar cousin Marie and she’ll tell you about the Octarians and how her cousin was kidnapped by them. I won’t spoil the the single player mode for you! You start off by customising your character, choosing between a girl or a boy – who are squids and kids! Then you pick the skin tone, your eye colour, your hairstyle and trousers. Next is the tutorial where it shows you the basics like shooting, manoeuvring and squid form, after you learn the basics you’re ready to go to Inkoplis Square! From there, you can compete in different multiplayer game modes against other inklings such as Turf War – a 4 v 4 game mode where the objective is to claim as much turf as possible to achieve victory. Use weapons such as the Splattershot Junior, a high fire rate but low range weapon to splat opponents while teammates cover turf. Win or lose, you rank up and get money to use in game. The more you rank up the harder the enemies will be that you face. To keep you from getting bored the stages change EVERY 2 hours! Splat Zones – Try to keep the 1 or 2 splat zones in your control, when you get the objective the points will go down. You start at 100 and first team to 0 points wins! Tower Control – Objective is to ride the tower to victory by reaching the enemy base passing checkpoints on the way. The enemies are also riding their tower to your base. If no one wins, it’s whoever is the closest. Rainmaker – Take the rainmaker to the enemy base. You start by popping a bubble with ink, then you need to carry the rainmaker to the enemy base. When someone picks up the rainmaker, a timer starts, if it reaches 0 the rainmaker will create a massive explosion and will return to the middle of the stage in a bubble. Calm Blitz – Collect 10 clams to create a super clam to throw in the enemy’s basket. If you die holding clams you lose your clams. 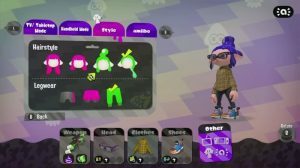 You have shooters which are your standard guns, the rollers which are good at covering turf but short ranged, chargers which are bad at covering turf but are effective at killing from long ranges, dualies are shorter ranged shooters but can dodge roll, brellas are short ranged two hit kill but have a umbrella to protect themselves, splatlings which you need to charge but unleash loads of ink, blasters which are low fire rate but can one shot, sloshers which are two shot kill and good range and brushes which are the best at covering turf but not the best at fighting. There are also a lot of sub weapons which consume ink and special weapons you charge by covering turf, to find out more go to the Splatoon 2 website here! There are also 3 clothes shops for hats, shirts and shoes which give you abilities and boosts! Check out the phone app called Nintendo Switch Online and on that there is splatnet 2 which allows you access to the shop, stats and voice chat. 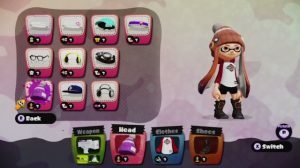 Once you order gear off splatnet 2 you go to Murch the sea urchin and collect it. Sometimes Splatfests happen where there are to teams which face off against each other for example cake vs ice cream… then you brawl to see which team won by popularity and victories! On top of all of this there’s also the Octo expansion, this is a great addition to the game. It gives you something extra to do – although there’s already enough to keep you busy! I won’t spoil it but you wake up as an Octoling with Cap’n Cuttlefish, an old fighter, looking at you. With the help of Pearl, Marina and Cap’n Cuttlefish you must try and reach the surface. Overall I give Splatoon 2 10/10! Interested in joining WICID.tv? Send us a message on Facebook or Twitter!